Sorry, Panel of 16 Old French Hand Painted Tiles by Helman, 1930s is not currently available. 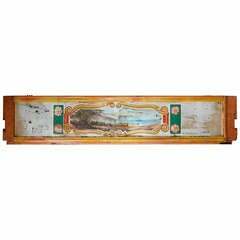 This hand painted panel from a carousel ride is a rare architectural salvage. Repurposed as wall art, it is a gem. One-of-kind. 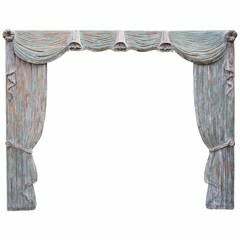 French hand-carved painted wood drapery panels with centre valence. 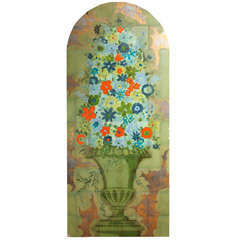 Inside measurements: 91.5" W x 86.5" H. Incredible worn painted finish. Handsome deco 1930s piece with original finish. Hand-carved. Original painted finish. European porcelain hand-painted blue and white tile Measures: 12" L x 12 "W x 0.38" H.
European porcelain hand-painted blue and white tile. Measures: 12" L x 12 " W x 0.38" H.